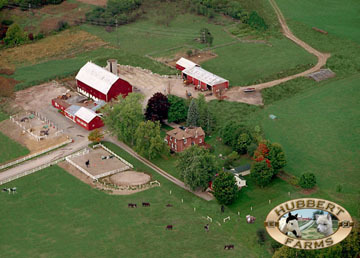 Hubbert Farms was established in 2002, the farming team of Larry Hubbert and Kathy McConnell quickly found their niche with the animals they love to raise. Hubbert Farm sells Alpaca fleece.. Hubbert Farm services include boarding and breeding. William C. Steinkrauss (b. 1899) and his wife, Florence Little (b. 1900) would be delighted to know that their homestead, a parcel of rural property on Lily Lake Road, is now back in the hands of grand-daughter, Kathy McConnell and her partner, Larry Hubbert. William and Florence Steinkrauss obtained the property in 1928 as a wedding gift. Over the course of the next 36 years, the hard-working couple built the original farmhouse, a second home for the farm hand, the barns and out-buildings, in addition to raising six children, (Johnny, Mildred, Bart, Marilyn, Whipple and Donna) while managing a herd of fifty dairy cattle and another business, Steinkrauss Lumber to sustain the growing family. n 1959, William severed a small portion of land on the property and built a home for his daughter, Marilyn and her two small girls, Tracey and Kathy. It was there, on the family homestead, that Kathy McConnell (nee Ingram) developed a passion for farming and animals. William and Florence sold the property in 1966 to retire to a new home in Bridgenorth (now called Steinkrauss drive). The property passed through two other owners hands in the next two decades, and when it came back on the market in 2002, Kathy and her partner Larry, both entrepreneurs in their own businesses, jumped at the opportunity to move to the country. The "newbie-hobby farmers" started with a handful of beef cattle, horses and pigs. Through trial and error, the pair planted and baled hay, mucked stalls and assisted in the birthing of dozens of calfs, colts and piglets. Kathy's pre-teen son Trevor tested his entrepreneurial talents by raising chickens and turkeys, each affectionately named either "lunch" or "dinner". Following the BSE beef issues in the early years of their farming venture, Larry and Kathy decided to disperse most of their cattle and embarked on a new venture - Alpacas.